« Why syncope is rarely fatal ? 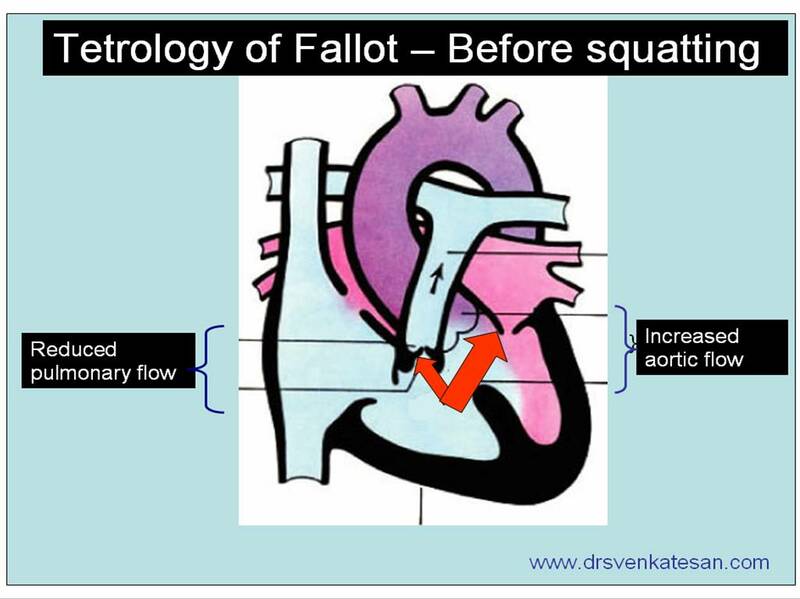 How does squatting help relieve exertional dyspnea in patients with tetrology of fallot ?
. It is a well known fact squatting is a simple compensatory posture adapted by children with cyanotic heart disease during exertion to get relief from breathlessness. The children with tetrology of fallot and related conditions have baseline hypoxia due to right to left shunting .This gets aggarvatged during exertion. Squatting promptly relieves this exercise induced worsening of dyspnea. The oxygen saturation improves immediately after assumption of squatting posture. The exact mechanism by which squatting relives the dyspnea is not clear. Immediately ( First 15 seconds) after squatting there is sudden drop in venous return. Sustained squatting for 1-2 minutes result in steady increase in venous return, raised systemic vascular resistance. Both these effects help the children with TOF.The initial trapping of highly desaturated blood in the lower extremity gives a quick relief as soon as the child assumes this posture.In the next 15 seconds or so the systemic vascular resistance increases and bring the the aortic after load sufficiently high to divert the blood into the pulmonary artery. The net effect of squatting is there is a transient or sustained (as long as child squats) increase in pulmonary blood flow and this is made possible by the relative reduction of right to left shunt as the aortic and systemic resistance is raised by this posture. What is the clinical inference from squatting in cyanotic heart disease? 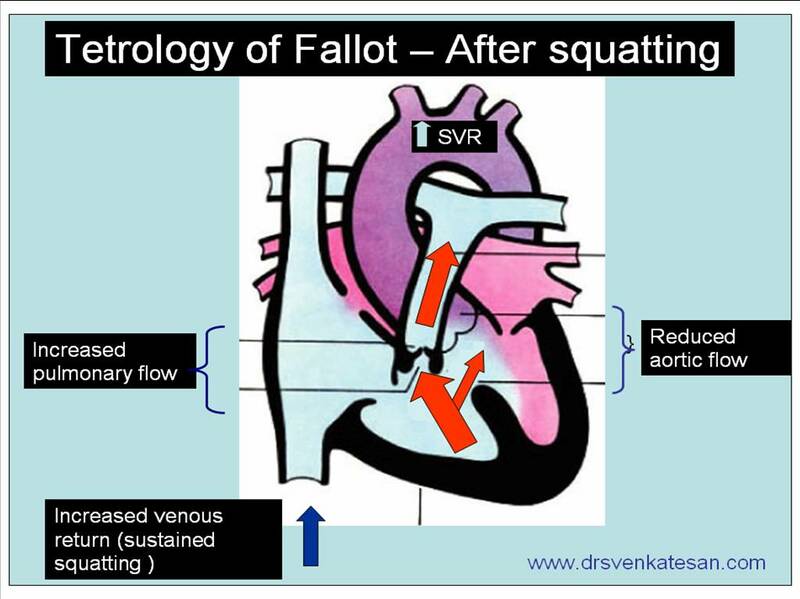 Squatting implies there should be a large VSD, associated with a delicate right to left shunting very much dependent on the degree of pulmonary stenosis or ( any RVOT obstruction) and the systemic vascular resistance. How common is squatting history in pulmonary atresia with VSD ? It can occur with collaterals are sparse.The mechanism of relief is slightly different. The likely mechanism of relief with squatting in pulmonary Atresia, VSD is two fold. 2.Sustained benefit is due to raised systemic vascular resistance which favors more flow across MAPCAs from Aorta. The second one has no authentic reference , but its a hemodynamic plausiblity as there is zero RVOT flow in PA with VSD. What are the other cyanotic heart diseases in which squatting is reported ?